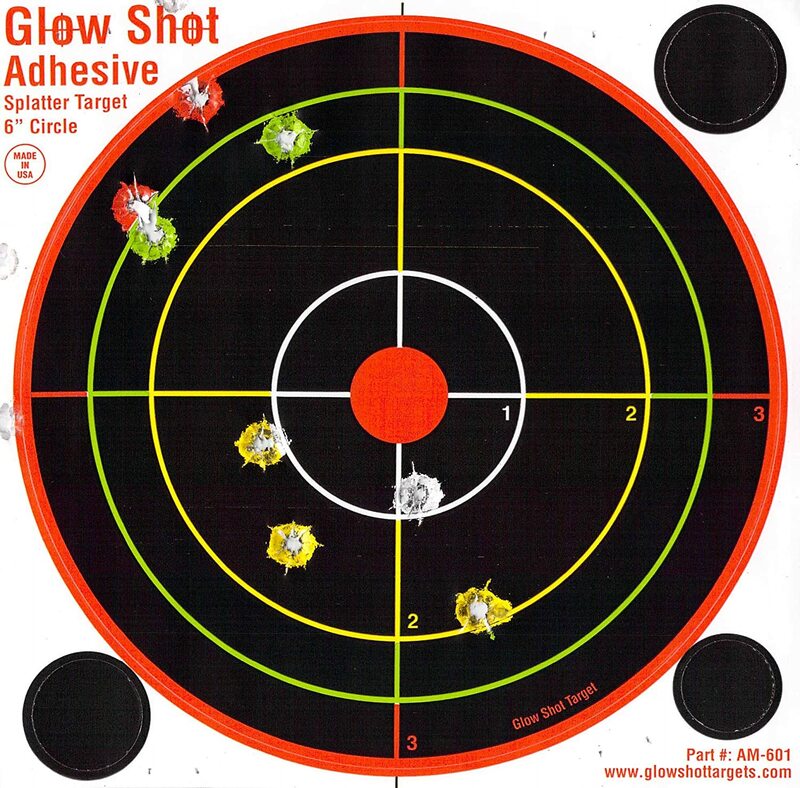 GlowShot targets are a modern invention manufactured in the USA. They are developed with the original version of reactive splatter targets, but now with the various colored zones that are printed on good quality heavy cardboard, to enable easy spotting of your hits from afar. If you are searching for the best GlowShot targets, you’ve come to the right place. Here we’ve laid out the top 5 best GlowShot targets in the market today. 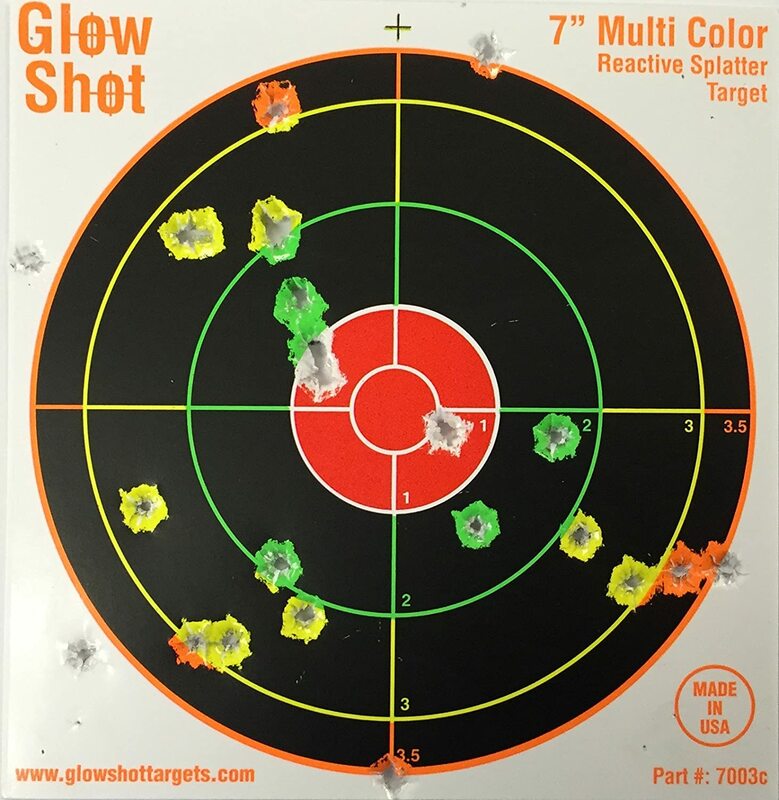 The GlowShot 6″ Multi Color Reactive Targets will show hits with a radiant halo around the bullet hole. This target measure 6.5”x 6.5” with a 6 inches peal and stick bullseye. Even from a distance, scoring is easier because the target displays different ring colors for each hit. 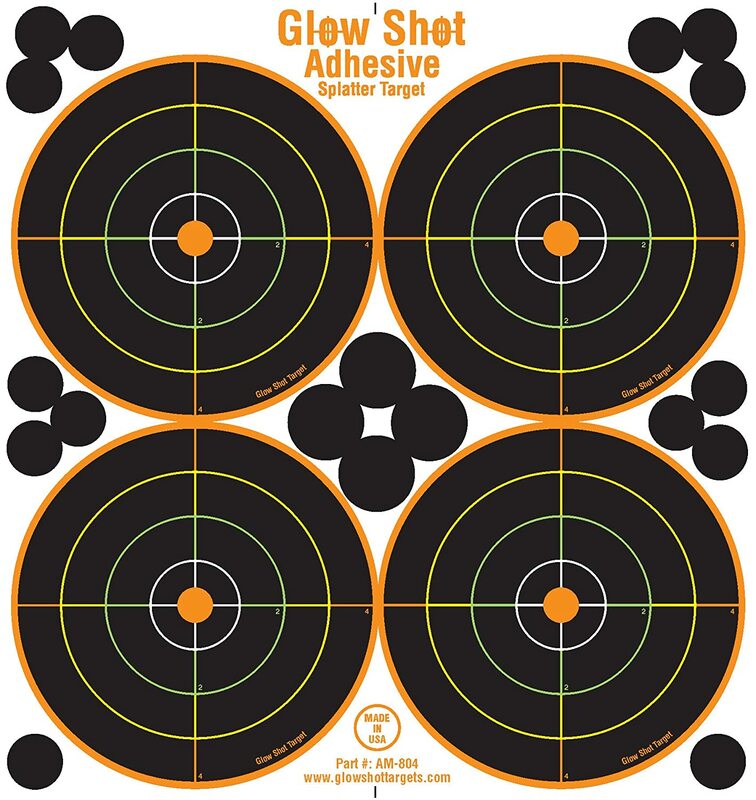 This target is made with heavy quality card stock making it ideal for target shooting using pistols, rifles and even Airsoft and BB guns. It comes with Adhesive Multi-color, Multi-color tagboard, adhesive yellow DayGlo and adhesive red. Using GlowShot 6″ Multi Color Reactive Targets, evaluating you accuracy 15 yards away is not a problem, but will still depend on your eyesight. That is for people who still have 20/20 vision. The GlowShot 6″ Adhesive Targets have earned a 4.5 star rating from us here from first hand experience. 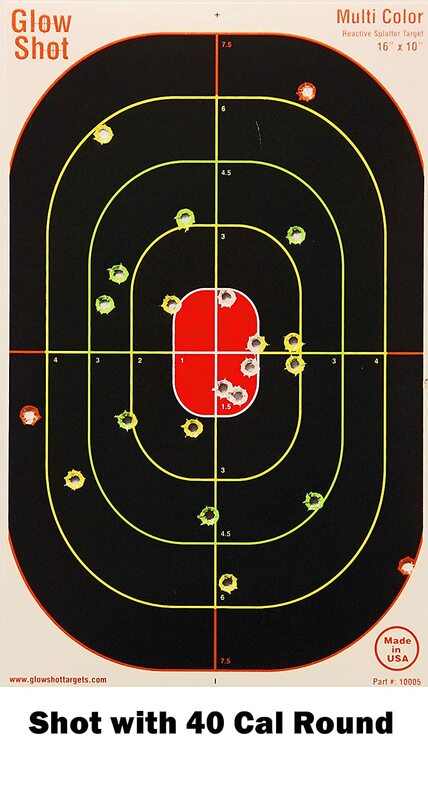 The GlowShot 16″ x 10″ Oval Heavy Card Reactive Splatter Shooting Targets is made from a thick and quality stiff card. Weight is dense making it good to hang on motorized hanger. The target displays a visible image even at 20-25 yards. Bullseye is seeable as well as the lines for each score. Bigger, thicker and made with non-adhesive heavy duty tag board, the GlowShot 16”x10” is for outdoor target shooting, withstanding dozens of bullet holes. This target also comes with 17”x10” adhesive multi color and 17”x10” adhesive DayGlo. This reactive splatter shooting target will show a bright halo over each bullet hole, in different colors. This will avoid picking a spotting scope or walking down range to see your hits. We give these targets an outstanding 4.7/5.0 rating, and they offer a good value online. The GlowShot 7 inch target is an ideal size to shoot pistols at 25-50 yards, making it a good choice for people who do not want large targets. 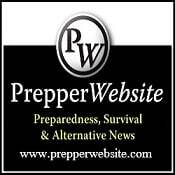 However, when shooting at 50 yards, you will need a spotting scope or binoculars to see your hits when using guns with calibers like 9mm, .357 and .45 acp. The inner ring also displays white when hit, making it harder to see, but some customers said they got this target with the center spot colored red in 2 inches diameter, which is more visual. The GlowShot 7” Reactive Splatter Targets is manufactured in USA built with quality. Made with non-adhesive heavy duty tag board that can hold off dozens of hits. This target works well with pistols, rifles and even pellets and bb’s. We give these targets a 4.6/5 rating thanks to their size and colors. This is a good buy. 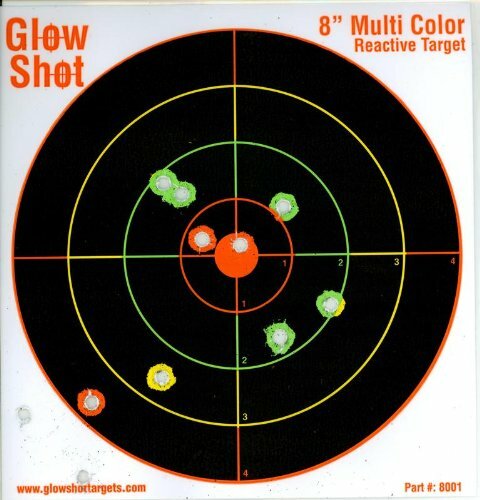 The GlowShot 8″ Reactive Splatter Targets lets you see your hits clear at 25-50 yards. Shooting at 50-100 yards will require you to use binoculars or spotting scope. Good thing about this target is that it is made available in 25pack, which means affordable price. The multi color tag board 25-pack is quite cheap for the 25-pack adhesive version is only slightly expensive. The adhesive multi-color targets are made with 20 degrees below zero rated adhesive and will not fall off easily. Some people who purchased the GlowShot 8″ Reactive Splatter Targets said that the black surface material sheds off if rubbed even lightly. You have to keep it away from magazines and ammo if you to have them in good shape before using them. This is common for targets of this kind though, not just for GlowShot targets. With a reasonable price, this target is still considered a good buy. The GlowShot 4 Bullseye is for outdoor target shooting in direct sunlight. The 4 targets in one board feature create a more concentrated shooting. Being adhesive, you can just peel the back off and attach it to a board – sticking it to a hard board is necessary as these targets are thin and flimsy. This target is a choice for people who have slight eyesight problems because of the target being reactive when hit. Every ring has a different color. The GlowShot 4 Bullseye 25-pack includes 4” targets per pack, so you get 100 4” targets for 25 packs. These targets are also quite cheap, especially when you consider that they have 4 targets on one paper. We give these targets a 4.5/5.